Welcome back to TV Fanatic's Grey's Anatomy Round Table! 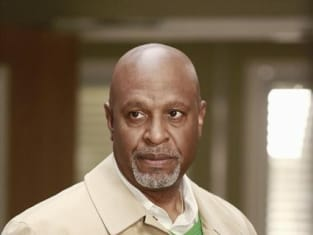 Last week's Grey's Anatomy review broke down "The End is the Beginning is the End" in great detail. Now, TV Fanatic staff members Sean McKenna, Christina Tran and Courtney Morrison are back for a Q&A discussion of many of the episode's events. Read their answers below and weigh in with yours! 1. Do you think April and Jackson will rekindle their relationship or do you like him with the intern? Christina: I'm not an April fan so I actually like Jackson better with the intern. Besides maybe April can find someone outside of the hospital for a change. Courtney: Long term, Jackson and April will end up together. But for right now, his little fling with the intern is kind of fun. A little less drama filled than his relationship with April. Sean: I feel like the show maybe wants April and Jackson together, but there's no way that will happen with the way April acts at this point. I'm curious to see how sleeping with the intern will work out or if he'll dramatically reveal that he's been missing April all along. 2. Will Alex and Jo's friendship last or will it become something more? Christina: This is a couple I am definitely rooting for; however, I'm also digging their unusual blossoming friendship. I say let them be friends for just awhile longer 'til they jump that brand new couch. Courtney: Definitely becoming something more! The past few weeks they have been setting them up to be a girl that Alex can trust. He deserves a relationship and I think Jo may be the one. Sean: I've got a strong strong feeling it will become something more. I'm kind of secretly hoping Alex would find someone else other than an intern (have all the interns hooked up with the doctors yet? ), but I have to say that the episode made me feel more okay with Alex and Jo together. It felt more at ease than overdramatic confrontation. I guess we'll see how it goes. 3. If you received $15 million, what would you do with it? Christina: I think about this all the time with the lottery and all. Of course I'd do whatever it took to be entirely debt free. Then, there's saving some and donating some even. Most importantly, though, I'd take my friends and family on the best vacation ever... or buy an island and move ASAP! Courtney: Like Christina said... first thing is to be debt free. Then of course, set up for the future of me and my family. Then it would be time to have some fun! Sean: Create world peace! This is always a tough one to answer but fun to think about. I'd probably dish out a few dollars to friends and family but I'm bound to get a few niceties for myself too. Fancy sportscar? Waverunner? A boatload of candy? 4. Who is your favorite happy couple and will it last? Christina: MerDer always. And of course it'll last! Courtney: No question. Meredith and Derek. They are the core couple of the show and they better live happily ever after. You hear that, Shonda? Sean: Meredith and Derek. They just work perfectly together even with everything they've been through, it will all work out for them. 5. How will Seattle Grace going bankrupt affect the survivors relationship with the hospital? Christina: It seems like it'd be too easy to assume that the survivors would save the hospital, but that's actually all I've got. I'm curious to see how creative the writers get with this one. Courtney: It will make them more of an outcast. They are already the doctors that all the bad things happen to and they are all having relationships with each other. I'm with Christina though, they will end up saving the hospital... it's like their home. Sean: I want this whole aspect of the show to be riveting and heavy on some real drama, but I'm afraid it will all work out easily and perfectly for everyone. It just feels like the survivors will end up helping the hospital, although the concept of Seattle Grace having to close is an interesting one. What do you all think of this week's Grey's Anatomy? Share your responses in the comments!